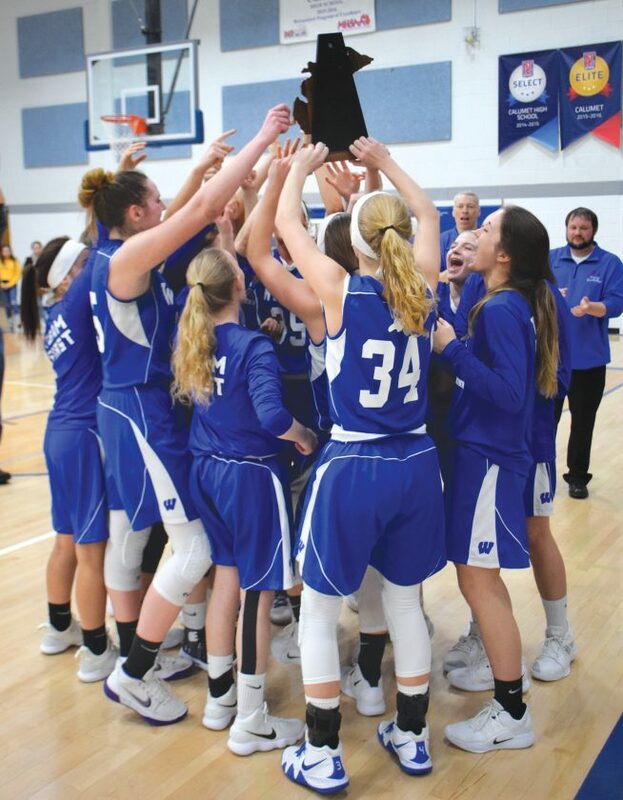 CALUMET – The Calumet High School Gym was loud and noisy Friday night as the hometown Copper Kings girls basketball team battled the visiting West Iron County Wykons for the Division 3 District 65 championship title. In the end, the Wykons made more noise on the floor and defeated Calumet, 55-41. The Wykons (19-2) will face Westwood in Escanaba on Monday, a team they have played and lost to earlier this season. “We wanted to play well tonight, and we put four quarters of basketball together, and it was a great game for us,” said Wykons coach Eric Shamion. The Wykons started off strong and never looked back. Within the first few minutes of the first quarter, they bounced out to a 10-4 lead thanks to baskets by Eden Golliher and a three-pointer by Colbi Laturi. The height advantage the Wykons brought onto the court clearly made a difference in their offensive attack. The Wykons starters included a 6-foot-1 center and a 6-foot forward. “Their height made it easy for them to get in the paint and get rebounds,” said Calumet coach Matt Laho. “We are starting girls who are 5-foot-2 and -3, and I don’t think they had a bench player that small. After eight minutes of play, the score was 16-10 in favor of the Wykons. In the second, the Copper Kings (12-10) had their opportunities to catch up but could not find the basket. The Wykons played a tough defense and left the Calumet no inside game. At halftime the Wykons led 27-14. “I told them at the half that we had to get back to doing what we do well — that is playing tough defense and making sure we get good possessions on offense and find the right shot,” Laho said. In a way, the Copper Kings did as they twice came within five points of the Wykons in the third. A jumper by Ava Anderson made the score 30-25, but the Wykons would not let up. “I was very pleased with the play of Mya Grubbs and Riley Stine,” Shamion said. “They both came off the bench and had nine (combined) points for us, which was huge. They gave us great minutes off the bench. In the fourth, it was more of the same as the Wykons stuck to their game plan and rolled on to victory. Golliher led the scoring for the Wykons with 23 points. Emily Nelson followed with 12. For the Copper Kings, Elli Djerf led the scoring with 11 points. 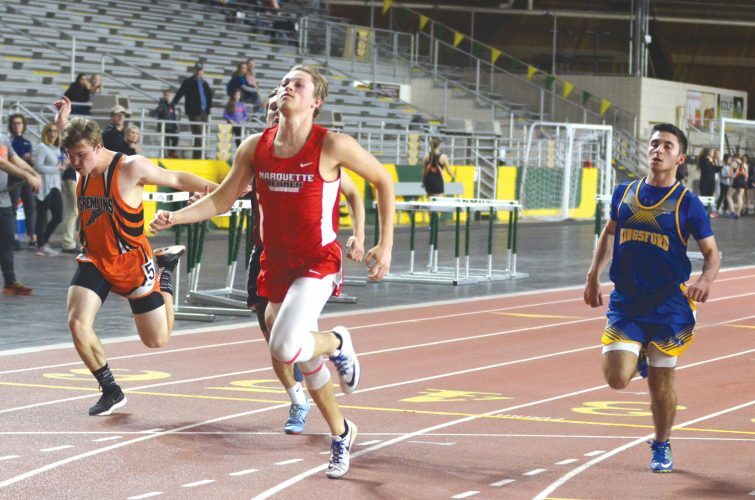 “Overall, it was a good season,” Laho said. “We grew a lot, and we got a lot better over the season. WEST IRON COUNTY (55): Malmquist 8, Nelson 12, Stine 5, Laturi 3, Golliher 23, Grubbs 4. F: 7. 3PT: Malmquist 1, Stine 1, Laturi 1 . CALUMET (41): Loukus 2, Anderson 6, Kiilunen 9, Djerf 11, Halonen 9, Torola 4. F: 15. 3PT: Djerf 3, Anderson 2, Kiilunen 1, Halonen 1.